We love the idea of adding greenery to our homes, but the actual execution and time commitment can be a little bit intimidating — which is why we’ve mostly dabbled in artificial plants. 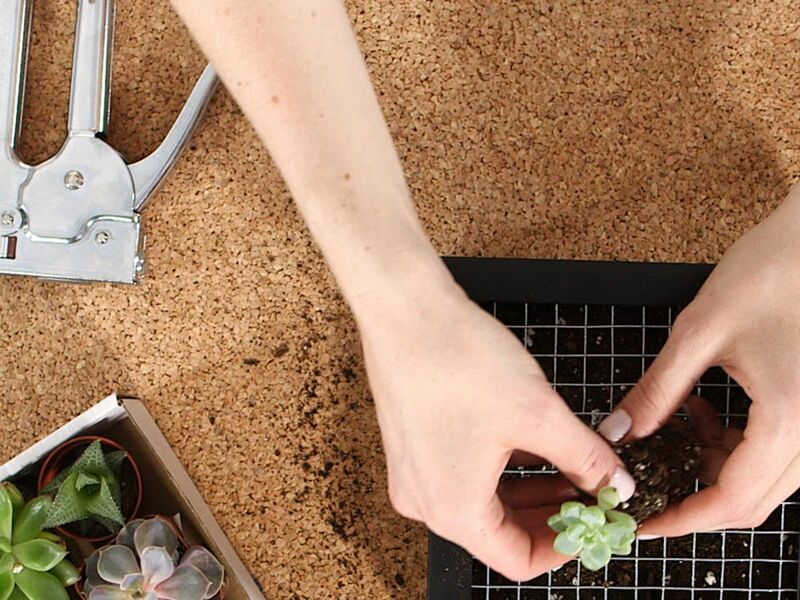 Cultivating our own terrarium or succulent garden sounds awesome, but hunting down the perfect greens that fits into our living spaces sounds like a huge endeavor. Luckily, our distressed signals have been heard by Bea Copeland, the resourceful host of our YouTube series Bea Organized. 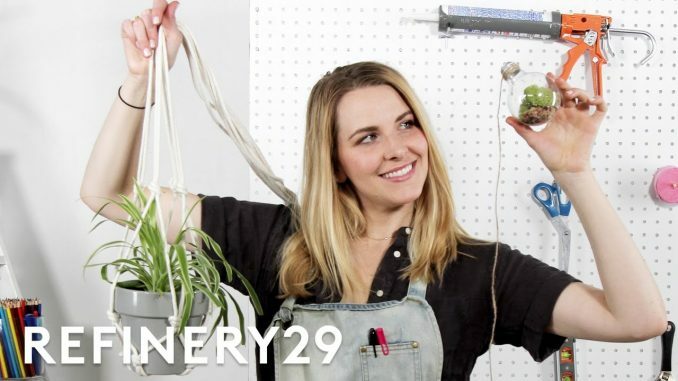 She’s devised three genius hacks to fashion the house plant of your dreams. 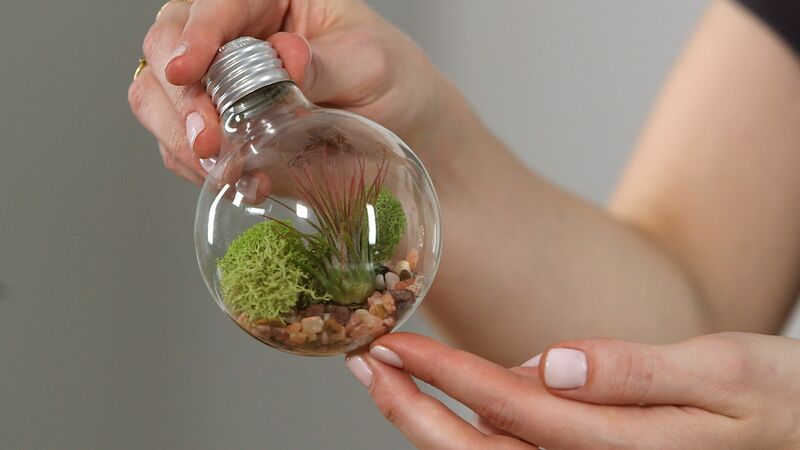 Read through for the simple step-by-step to create your own light bulb terrarium, succulent garden, and air planter — no green thumb necessary. 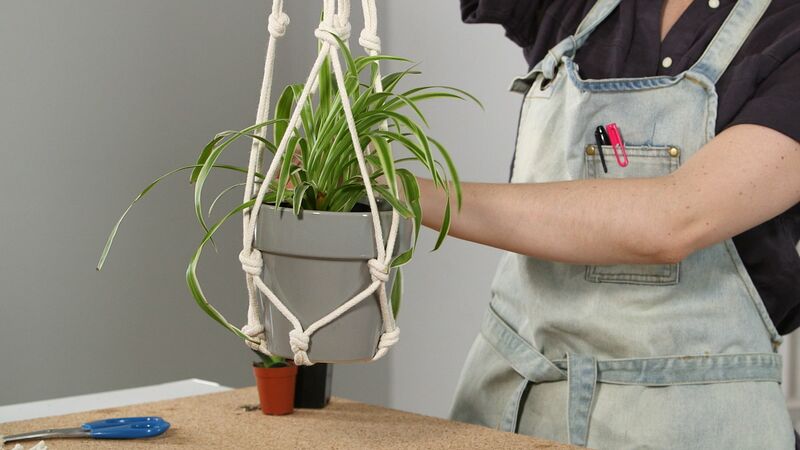 A hanging planter is an easy way to get plants off your shelves and suspend them from the ceiling. 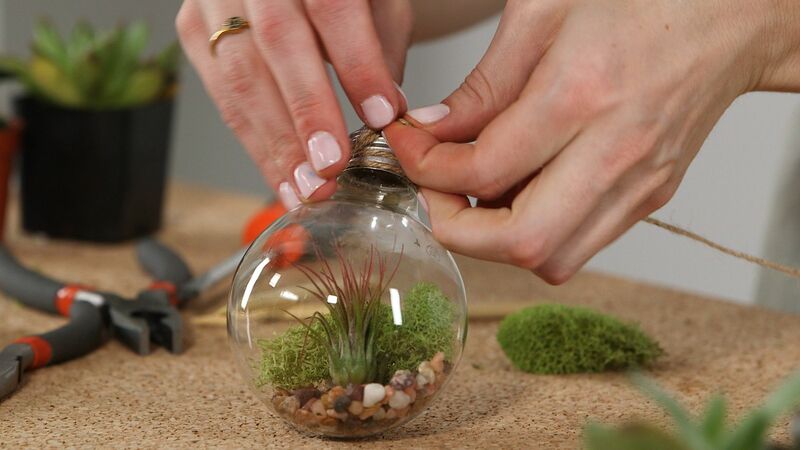 All you need for this project is a pot, a plant, scissors and a hook. To start, cut your rope into eight pieces. The length is dependent on how long you want to make it, but make sure the pieces are all even. 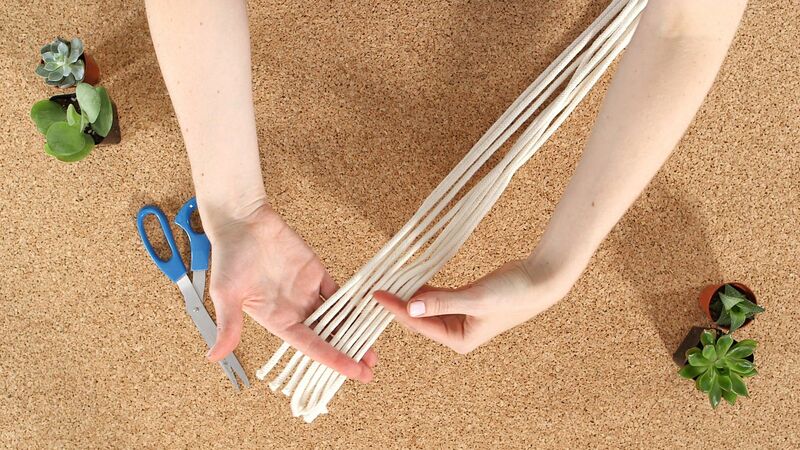 Tie the rope pieces in a simple knot. And cut away the excess material on the inside of the pot. It helps if the pot has a hole at the bottom to feed the rope through. If not, you’ll need to tie the pieces on the outside. 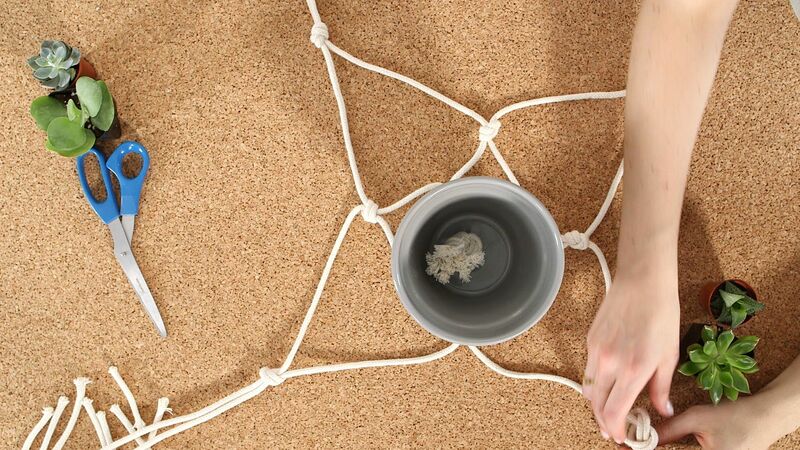 Cut away the excess rope from the inside of the pot. Placing the pot top-down, divide the strands into pairs and tie knots so they rest right above the base of the planter. As you go along, make sure the knots are tight. 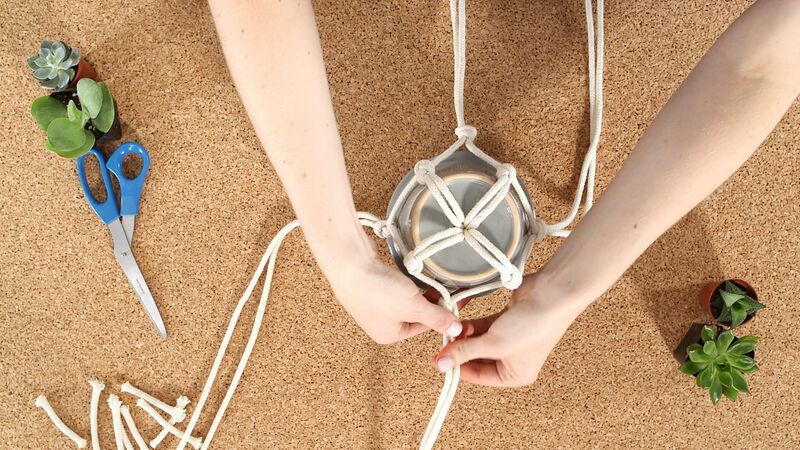 Next, take strands from neighboring rope pairs and tie them together forming a diamond shape. These knots should rest right underneath the lip of the pot. Flip your pot over and tie one more set of knots like before, creating another set of diamonds. Now it’s time to add your plant. Once you’re done, use a hook to fasten the finished product to the ceiling. 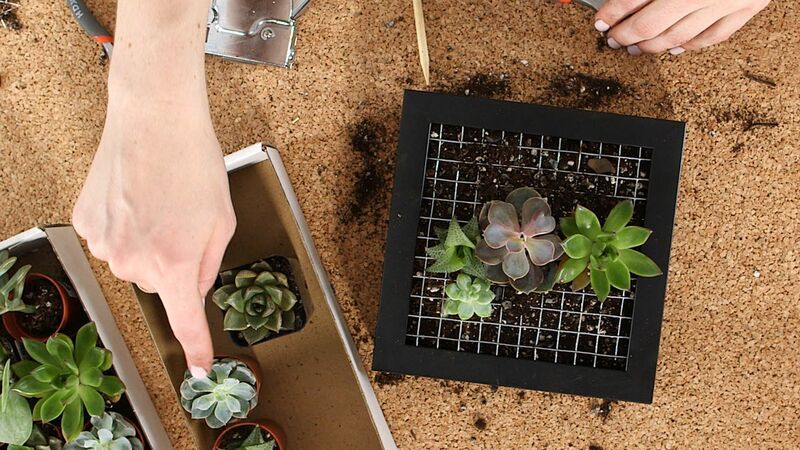 This hack turns succulents into artwork. 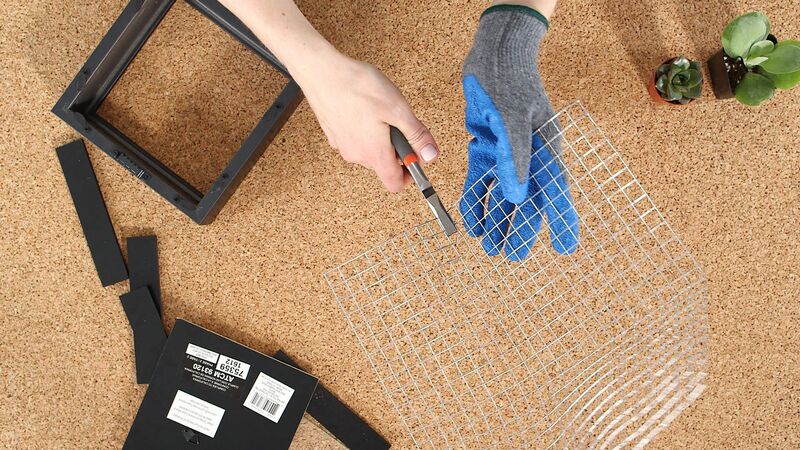 You’ll need chicken wire, a cheap picture frame, staplers, and some pliers to start. 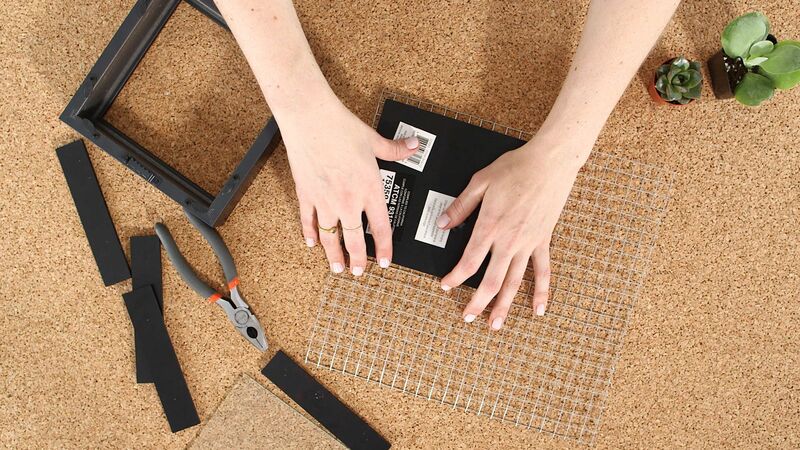 Take apart your picture frame and grab the cardboard backing, which we’re going to use to measure the chicken wire. Fold the wire around the frame to mark the edges. Take your pliers and cut this section out of the wire. 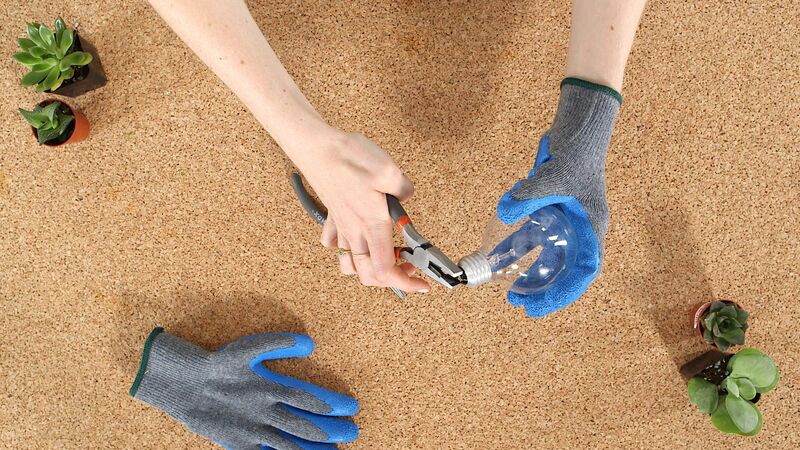 Be sure to wear gloves as the edges can be pretty sharp. 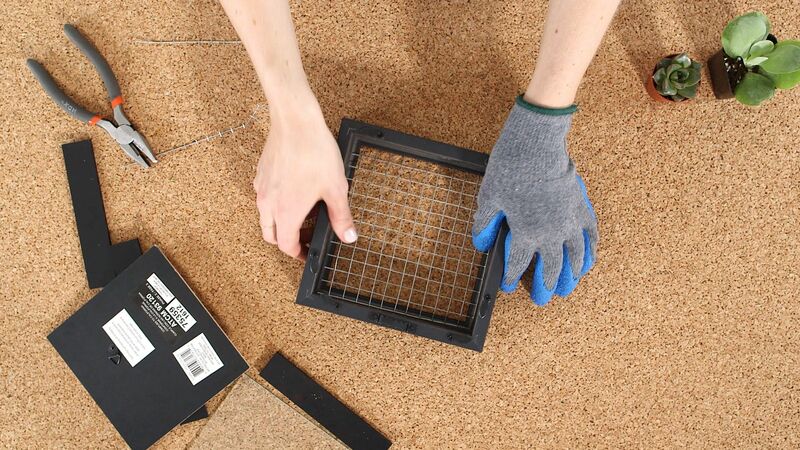 Keep cutting until you have your wire square into a perfect fit for the frame. Staple the wire to the frame, and pop the cardboard back of the frame back on. 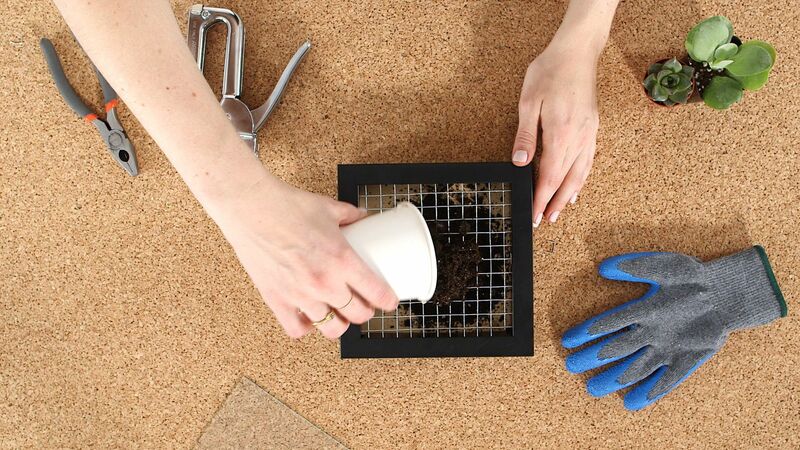 Flip everything over and pour your dirt into the frame. Fill the frame about three-quarters of the way, right under the chicken wire. You want to leave enough room to plant the succulents in the dirt. One by one, plant your succulents in. You’ll notice that some of them will be too big to fit into the wire as is. All you have to do is cut enough space in the chicken wire to get enough roots into the soil. The chicken wire will keep them in place when we eventually turn them sideways. Once you make sure everything fits snug, you’ve got yourself a succulent garden to hang! 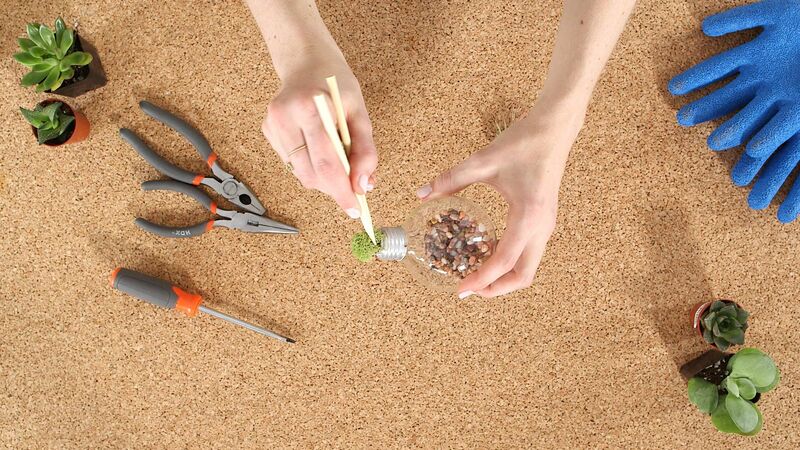 To make a lightbulb terrarium, you’ll need a lightbulb and some pliers, which we’ll be using to dismantle the lightbulb. 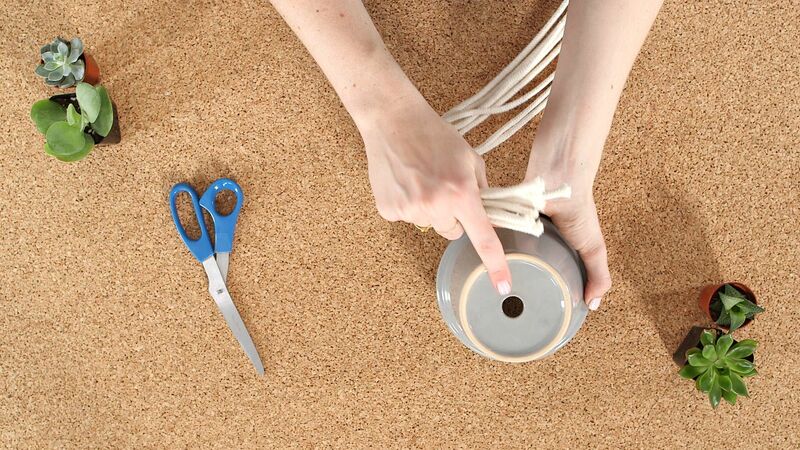 Take the lightbulb in one hand, and use the pliers to break the narrow end of the bulb to create an opening. It’s important that you wear gloves for this because as you take this apart, broken pieces of glass will be everywhere. Once you’ve broken off the tip, use a screwdriver to take out the remaining glass and filaments. 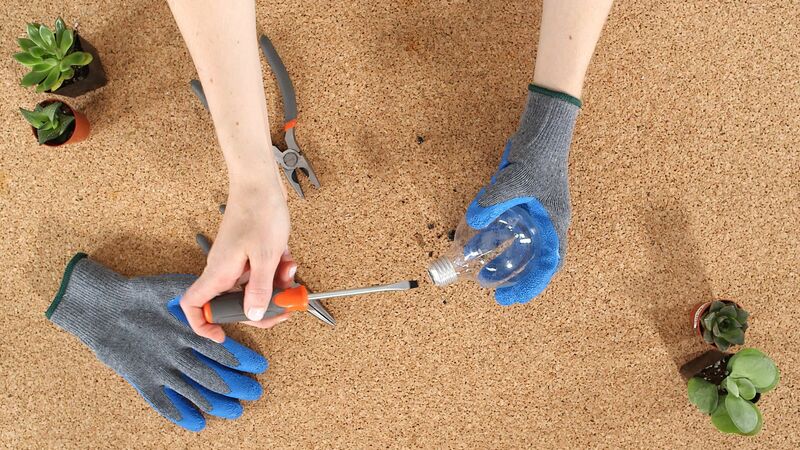 Pour a handful of small stones into the lightbulb as foundation. Then, using a pair of chopsticks, put some moss on top of the rocks. Finally, add an air fern which is perfect for this type of terrarium, because it doesn’t need soil to grow. 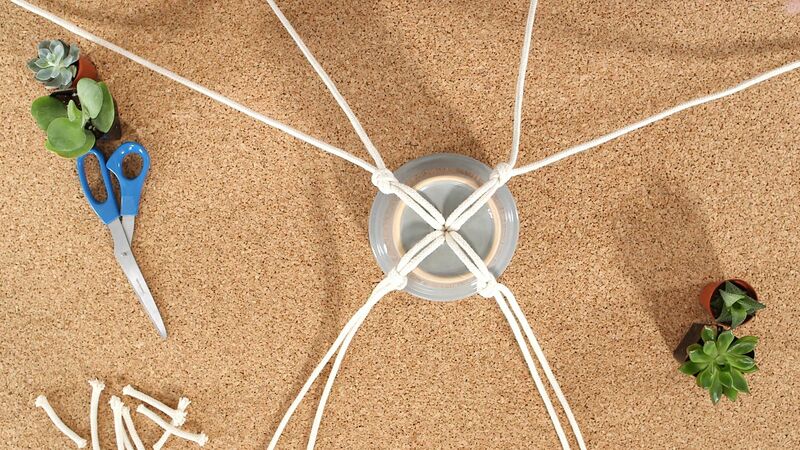 If you want to hang it up, attach some string to the top. Watch the full tutorial to see the step-by-step.